This was a recipe inspired by the version of this dish that Shoryu have on their menu, as my husband had it at the Regent Street restaurant and insisted I had a go at making my own version. Kimchi is a Korean pickle made with a Chinese cabbage and has a spicy, sour, tangy flavour. Combined with miso and stock, it makes for a tasty broth and goes really well with seafood. You can use whatever seafood you like- you could even add small pieces of fish, if you wanted, as long as the pieces are bite size and the fish firm enough to not break up in the broth. This is a perfect ramen as we approach summer and warmer weather- it is not as heavy as some of the other recipes I have made. Whilst recipe testing, my husband said he felt the broth didn’t taste of seafood enough. Now, I prefer it that way, but if you want a more intense fishy flavour, just substitute the chicken stock for fish stock. I get the baby squid from the frozen section in Tesco. They are ready prepared and are great for use in all sorts of oriental dishes. To accompany: Wild cherry Sencha green tea from Imperial teas. This Sencha tea has a subtle floral cherry undertone that seems to work really well with spicy foods, so it is great with this fiery ramen recipe. Prepare the squid, if necessary, then separate the tentacles from the body. Slice the body in half lengthways and score with a knife diagonal lines about 5mm apart across the inside of the flesh. Turn the body the other way and score again, so that a criss-cross pattern forms across the flesh. Heat the groundnut oil in a large wok on high heat. Fry the chopped garlic, ginger and chilli until aromatic. Add the chicken stock to the pan, bring to the boil and turn the heat down. Add the miso, kimchi and juice, soy sauce, chilli bean paste and mushrooms. Stir to mix and keep warm. Heat a frying pan with 1 tsp. of groundnut oil and stir fry the prawns until pink and curled. Season with a little salt and black pepper. Remove from the pan and keep warm. Cook the ramen noodles as per pack instructions. Add a tsp. of groundnut oil back into the pan and fry the remaining garlic until aromatic and browned. Add the scallops, season with a little salt and black pepper and fry for 2-3 minutes. Turn over and fry on the other side. Add the squid to the kimchi broth just as the noodles are done. It was cook and curl almost immediately. Take the broth off the heat, so that the squid doesn’t overcook. Drain the noodles and divide between two bowls. Ladle the broth over the noodles and then top with the prawns, scallop, samphire, half an egg each, beansprouts and spring onion. Top with the toasted sesame seeds and a dash of la-yu, if desired. Heat a frying pan on high with 1 tsp. 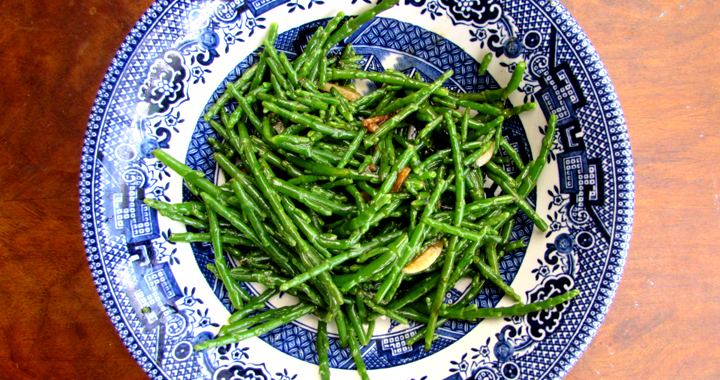 of groundnut oil and add half of the remaining garlic until aromatic and then add the samphire. Turn the heat down and stir fry the samphire for a few minutes until softened, adding a squeeze of lemon juice and a sprinkle of white pepper. Take off the heat and add a tiny dash of dark soy sauce, stirring to combine. 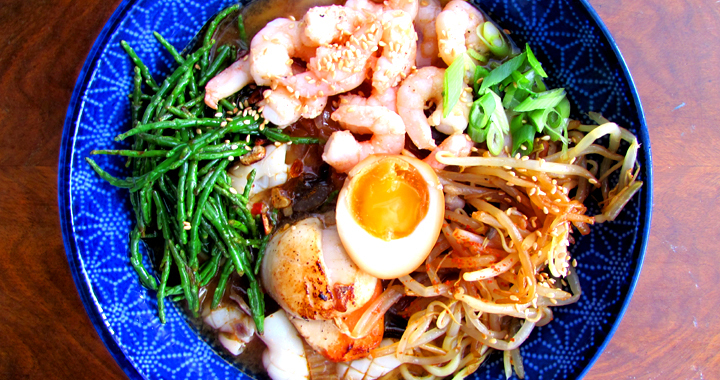 Posted in Ramen Dishes, Recipes and tagged Chilli, Kimchi, Ramen, Samphire, Seafood.